Have you ever tried to make a bucket bag fit a rectangular laptop? Or bought a computer case with the hope of carrying it around under your arm, only to completely neglect it every day? (Been there, done that.) It’s kind of funny how some people will spend three figures on a handbag but are reluctant to buy something that will protect their pricey laptop. Yes, the term “laptop bag” may sound dull, but that doesn’t mean there aren’t chic options out there. In fact, one of my favourite brands—Knomo, the solution to my six-month search—makes the sort of laptop bags that are perfect for work and beyond. The brand’s bags are also padded inside and feature pockets and slip pouches, making a meagre canvas bag obsolete. In a climate where more and more us work flexibly, the office can be anywhere now. And since you’re always going to need your tech nearby, we’ve rounded up the most desirable laptop bags currently on the market. Whether you’re after a practical tote or a polished rucksack, these pieces work hard to make your life easier (and won’t cramp your style in the process). If you want a weekday tote that can moonlight as a weekend bag, look no further. 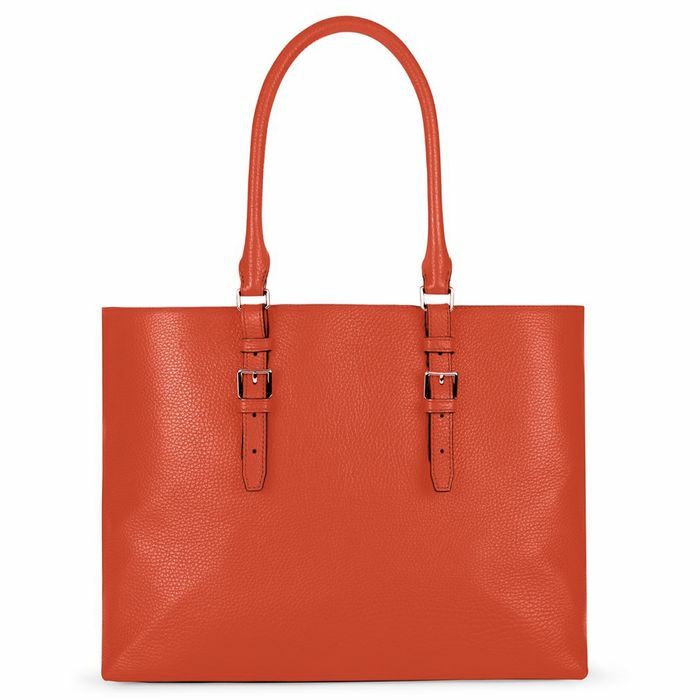 This zingy orange option (which would look great with a navy coat) can hold your computer plus all your weekday essentials while looking playful and polished. This chic rucksack won’t cramp your style—just ask those who have reviewed it on the John Lewis website. We love its numerous inner and outer compartments. Amassing almost 40 four-star and up reviews, this Wenger tote is ideal if you tend to carry your life around. Its vast size is noted upon consistently, so if you want to carry your laptop, charger, notebook and a spare cardigan to work, this is the tote for you. This smart bag is lined with suede, so you know it doesn’t scrimp on luxurious details. You can slip a laptop in midweek and continue to use it on the weekend. Plus, it comes with a pochette to house keys and change (which usually fall to the bottom). Traditional-looking, sure, but this backpack is equipped to handle modern life. It can fit a standard laptop and a few extras—a purse, notebook, sunglasses and snacks. Plus, it’ll just get better with age. Smart, serious and capable of housing your most valuable work components. This versatile piece of arm candy comes with a high-capacity charger (good enough for two full charges) that’s compatible with most computers. Another brilliant Knomo design in a punchy raspberry hue. This beautifully minimalistic bag (and the site’s customer service) gets rave reviews. It can be carried by its top handle or slung over both shoulders as a rucksack and easily accommodates a 14” laptop. You’ll never regret buying a well-made, vast grey tote—especially when it fits all your essentials and is lined with pink. Next, shop the most desirable ankle boots on the market.